Terminator 2 isn’t just a film, it’s an achievement. James Cameron managed to create a movie that was not only tense and action-packed, but also revolutionary. It was the harbinger for what visual effects could do, and changed the industry forever. And it turns out, a lot of it was made possible by a small group flying by the seat of their pants, just to see what would work. VFXBlog interviewed over a dozen Industrial Light and Magic veterans about Terminator 2 in anticipation of its 3D re-release. A lot of the interviews are stuffed with techno jargon (I’m assuming that’s the term, then again my idea of “The Cyber” is Sandra Bullock having her identity stolen). But it largely boils down to the crew using, improving, or downright inventing the technology needed to make some of the film’s dynamic shots. For example, the film used Motion Capture before the concept really existed. 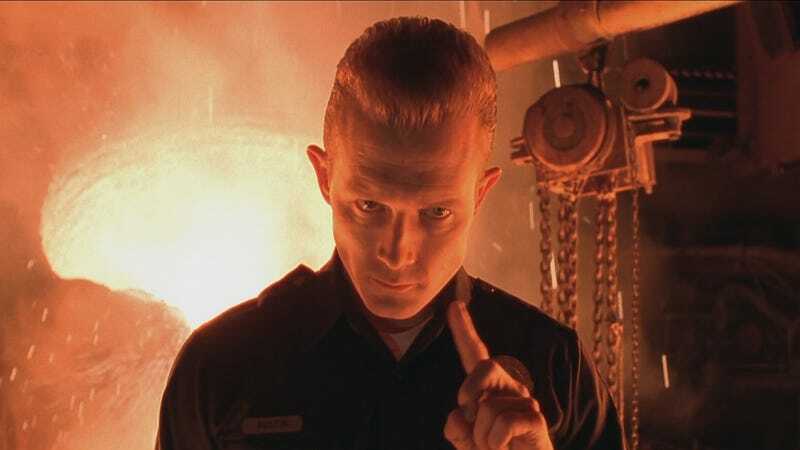 As shown in the video above, in order to digitize Terminator 2 star Robert Patrick’s form, so they could turn him into the chrome T-2000, they painted a four-inch by four-inch grid all over his body, then filmed him simultaneously from the front and side so they could rotoscope his movements. “We had him run, and he ended up running so much on a rubber mat that we had that he ended up blistering his feet, to the point where we had to cover his feet up,” animation supervisor Steve Williams said. There was also a funny tidbit about how the hospital hallway (where the T-2000 comes up through the floor) only had white linoleum, but Cameron wanted checkered tiles to make it look creepier. So some poor schmuck had to place black stickers over every other tile along the entire hallway to make it look like it was tiled. That’s not a digital thing, but it did make me chuckle. I definitely recommend checking out the entire oral history, especially if you’re someone who’s into the history of visual effects. It might be long, but it shows how much Terminator 2 accomplished and everything Industrial Light and Magic achieved to bring the iconic movie to the big screen. The film might be over 25 years old, but it still holds up... and a lot of today’s movies owe their success to what Cameron and his crew created. “Terminator 2 was simultaneously the most fun and the most difficult project of any sort, professionally or scholastically, of anything that I’d done up until that point. I still think that looking back on the work today it still holds up really well, even by modern standards,” shot supervisor Doug Smythe added.